Looking for fitting invitations? Try these flower invites. No matter where you're planning on hosting the party indoors or in your backyard the Summer months afford you a lot of opportunities for shower themes. Unless you're throwing a surprise party for the bride you will want to ask the bride what she prefers. Here are some ideas that will not only make your best friend and guest of honor feel loved, but your wedding shower a memorable one. To make sure you don't end up in the bland shower pitfall we've put together some ideas to help you out. One excellent idea comes from our reader Beth. Beth loves throwing shower's during the Summer since it gives you a perfect excuse to have a flower shower. 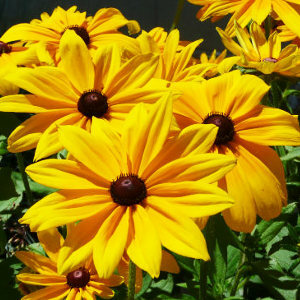 Summer flowers like the Black-Eyed Susan are in abundance during this time of year. These beautiful golden flowers combine ivory and they make a stylish and affordable theme. The warm months also lend themselves to devilishly delicious shower theme. If your bride is an ice cream fan then you may want to throw a Gelato shower. Make sure you have plenty of base ice cream and different flavors so that the party goers have a chance to mix their own ice creams. If you're in need of some ideas Jeni shares some splendid recipes! This party type is fun because there is a lot of room for fun games. One of which is to have everyone mix their own flavors and allow the guests to vote which ones they like best. Give the winner a prize. If your bride and groom are planning on going on a tropical honeymoon, why not get the party started early? Choose an island inspired menu and decorations like this Luau table skirt for this party. Make sure to pass leis out to your guests as they come in the door. And don't forget the hula dance game! Make sure you have some alcohol free cocktail options for your guests.